Along Alum Creek, south of the damn, 112 acres of land owned by Preservation Parks of Delaware County is currently undergoing a reforestation, which involves the planting of 550 burlap-wrapped trees, 17,000 seedlings and shrubs. Logan Dunn, a Preservation Parks technician, digs a hole that will become the new home of the tree that lays alongside it. Preservation Parks of Delaware County is reforesting 112 acres of recently acquired property south of the Alum Creek Damn along Bale Kenyon Road for a future park. Hagan said the land cost $3.8 million, but the cost was offset by a grant of $2.8 million from the Clean Ohio Fund. According to Hagan, the reforesting will speed up the restoration of habitat to what it would have been before the settlement of the area. She said it will improve the wildlife habitat, prevent erosion, and improve the quality of Alum Creek as it flows through the property. Hagan added the park district will create a “concept plan and master plan to determine all the features” of the new park. She said the plans include trails that connect to Orange Township and Westerville trails, access to Alum Creek for fishing, canoeing and kayaking, and picnic areas with shelters and restrooms. 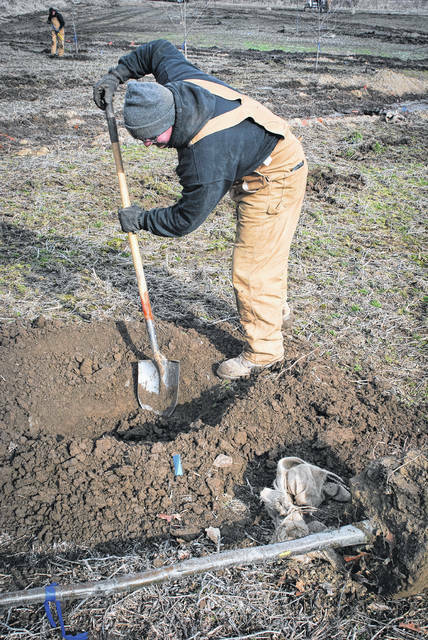 According to Chris Roshon, natural resources manager for Preservation Parks, his crew will plant 550 burlap-wrapped balled trees, 17,000 seedlings, and shrubs in the field east of Bale Kenyon Road to begin the reforestation. He said the labor will be provided by park district employees, volunteers, Olentangy Orange students, and in part as an Eagle Scout project. “This is the largest tree planting the park district has ever done,” he said. Roshon added the burlap-wrapped trees being planted are about 6 years old and the seedlings are a couple of years old. He said the trees are a variety of oaks, hackberry, sycamore, buckeye, hop hornbeam, black cherry and sumac. All are native to Ohio. Roshon said last fall, the park district removed about 8,000 feet of drainage tile to restore the “natural hydrology” of the fields. He said this past fall, the former owner of the property was harvesting a crop of soybeans from the fields. Over the winter, Roshon added, the fields were seeded by hand with a prairie mix of pollinator-friendly flowers and warm season grasses “to help fill in the gaps and add structure to the habitat” as the trees took root. Roshon said the project is visible from I-71 on the east side of the interstate with a couple of billboards just north of the project. “It’s a beautiful little floodplain,” he said. Roshon added during the time the park crew has been out planting trees, they had seen deer, wild turkeys, and a bald eagle that quickly swooped by low to the ground. This entry was tagged Chris Roshon, D. Anthony Botkin, Delaware County Ohio, Preservation Parks. Bookmark the permalink.